As preparations were being made for my trip to El Salvador we were told of the cultural shock that we would experience. Upon multiple things we were told that their would be no hot water, that their is barbed wire everywhere, that the children loved stickers, and that it is a catholic country. It was one thing to tell us about what will be to what actually happens. When we were told of these many things, they had a very small impact because it never really sunk in. It was only until we got to El Salvador that we began to feel nervous because of the barbed wire, upset that their was no cold water, and to see how truly happen the children were to receive stickers. It was only until the actual adventure that all these statements became alive and left a mark. Today, Canadians take the day to stop and be thankful for everything that we, as a nation and a citizen have been blessed with. Yesterday we heard the story of the rich man wanting to follow Jesus. However, he left disappointed because Jesus called him to give up his possessions. Thanksgiving is a time where we can be thankful for the things that we have, and to remember that the items and things we do have are used to bring us closer to God and eternal life. It reminds us that our relationships with family, friends, strangers and God are most important, and that the need for possessions must always come last. Happy Thanksgiving everyone! I hope you enjoy the day with family, friends and lots of fun! Last weekend I had attended a vocations retreat for those discerning their vocation in life. One day at lunch I was sitting with the Jesuit priest who had been vocation director for the Jesuits in Canada for 16 years. He had explained that the Jesuits, as part of their entry must go on a trip, with a one way ticket. Their ticket was either to their location, or back. However, they were not allowed to bring money and very little supplies. This trip could be anywhere in Canada or the United States. The point of this trip, the priest explained was to develop within the novices a reliance on the divine providence of God. As we draw a closer and closer to the end of our liturgical year, the readings focus us on eschatological events. It brings our attention to the identity of Jesus and what his ultimate goal is. The readings have now begun to build up to the climatic end of the feast of Christ the King, when Christ is finally revealed has king of the whole world. However, with the readings now, we learn a part of Jesus that is new to the disciples. We learn that Jesus will be/ is the suffering servant. That he has come to serve and not to be served (Mk 10:45) and that he has come to set an example in living our lives (Jh 13:15). Since his election on March 13th 2013, Pope Francis has given the church a renewed mission to serving and aiding the poor and marginalized. He has made an effort, in being pope, to refocus the mission of the church to care for the poor. In his Encyclical The Joy of The Gospel His Holiness writes," If we who are God's means of hearing the poor, turn deaf ears to this plea, we oppose the Fathers will and his plan... A lack of solidarity towards his or her needs will directly affect our relationship with God. " (187) Throughout his papacy, thus-far, the pope practices what he preaches. He has installed wash rooms with showers for the homeless, he has had sleeping bags with his coat of arms given out at night, he has has barber shops open for the poor, and much more for the sake of poor. Four years ago today, I started a new adventure in my life, a blogging one. An adventure that would use creativity, courage, intelligence, time and perseverance. On September first 2011 I had started my first blog, Life of Us an Saints. It was a small blog, (but big in my head!) I remember my very first blog post was on Pope John Paul the Second, and how I thought he would be a good saint. I quote myself from 2011, I promise I haven't changed anything, " I am thinking by 2015 he will be a saint... Who knows it could be earlier or later." He was canonized in 2014. Wow! If you search hard enough, I am sure your could find the post. Friday night, as I sat in bed watching T.V I heard the talk show host, explain that rules give us freedom. I had no idea what they were actually talking about, but by the time I got settled into bed, and paid attention to the lady on the Catholic channel, I had become fixed on this intriguing idea presented. Obviously, I had zoned out of the rest of her conversation, and when I had come to accept the idea, the host was saying good bye. As I woke up the next morning, again the thought-provoking idea repaid a welcomed visit and it became the focus of my thought for majority of the day. For the past five weekends we have journeyed through the "Bread of Life" discourse in the Gospel of John. On this path Jesus has gained followers, increased his popularity, multiplied loaves, and began teaching one of the most difficult subjects for his companions to hear. Today, we come to the conclusion of this discourse with a final question: to believe or to turn away. The great crowds that had once followed him and were amazed by him, have now become perplexed by His words and have left. However, Peter responding for the apostles, replies, " Who else can we go to Lord?" Earlier this past week the church celebrated the feast day of St Maximilian Kolbe, a priest and martyr. St Maximilian was once quoted in saying, "If angels could be jealous of men, they would be so for one reason: Holy Communion." Maximilian was stressing, within this simple quote, the power, necessity, and specialness of the Eucharist, that it would make even the angels jealous. For the past five weeks within the Sunday lectionary, we have heard the "Bread of Life" discourse from the deeply theological Gospel of John. This discourse is the first theological work on the Eucharist, the bread of life. Within this discourse we begin to develop our Eucharist celebrations, traditions, and reasoning. Heavenly Father, We pray for those whom are affected by the explosions in China. We pray for the safety of the people living there, and for the healing of those who have been hurt. Grant eternal Rest, we pray, to those whom have been taken by this horrific event. Send forth your spirit to comfort those who remain, and to those scared by the horrors of this event. We pray for the people in China, that your protective mantle may cover them, and assist them in their time of need. We ask this through Christ our Lord. AMEN. ps. You can watch the video, and read the article about the explosion here from CNN. I would say one of the most quoted lines from the Documents of the Second Vatican Council by Catholics (including bishops and lay people bloggers) is that "the Eucharist is the source and summit of the Christian life" (Lumen Gentium 11) This quotes teaches us that the Eucharist, which is the body of Christ, must be received by his gathered people, which make up the living body of Christ. The Eucharist is the churchs foundation, it is the source where accomplishment, acceptance, unification and compassionate hearts are formed and fed among its members. The Eucharist, also is the peak of the mountain, the most incredible thing that is truly the summit, of a Christians life. The readings this weekend express the need for our source, and who the source is. "Give Us This Day, Our Daily Bread..."
Heavenly Father, I am presently embarked on a journey in pursuit of some good. Grant that I may travel in safety, without undue disturbance or worry, and ultimately attain the goal I seek. Let me also keep in mind that I am on another and more important journey-through life. Keep me ever safe and close to You as I travel the sometimes hazardous road toward your kingdom in heaven. Enable me to follow the guidelines given us by Your Son Jesus so that I may arrive safely at my eternal destination with You in heaven. St Anthony, Pray for us! 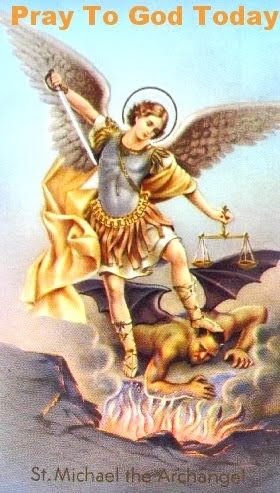 St Raphael, Pray for us! St Joseph, Pray for us! A couple years ago a long time parishner had left this world, to join the heavenly father. She was an elderly lady and was a parishner since the openings of the parish. She sat in the same second pew every day when she came for Mass, and would be behind everyone in saying the responses. She was a lively women who had loved to talk to people and extend a warm smile to everyone. One thing in particular that I remember about this women was her faith. When she walked in to the church, she had a routine, and she stuck with it. Before she would say hello to anyone, she would walk in, mark herself with holy water, walk over to the blessed sacrament chappel bow, and has she headed to her spot she would bow to the Altar. Only then, would she start to smile, wave and talk to people already their. She had placed her faith first and it was so evident.